Tigh na Cidhe translated from the Gaelic means House on the Slip. This beautifully renovated house is in an iconic isolated position. 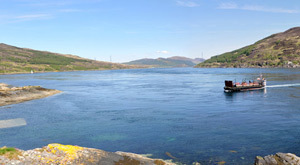 It sits on rocks less than 10 metres from the high tide with uninterrupted magnificent views north and east across the Kylerhea narrows to the mainland. 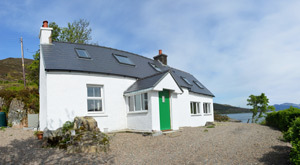 The house is next to the Kylerhea ferry slip and at the very end of the Kylerhea road. At the beginning and the end of the day in summer as well as all of the time in winter the house is totally isolated with only a few houses in view across on the mainland. There are breath-taking views and the house is ideally situated for viewing the northern lights. 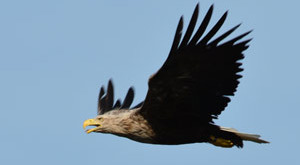 Kylerhea lies in a Special Area of Conservation and is particularly noted for the abundant wildlife. In the water our daily visitors, the seals and otters catching fish and crabs, while dolphins, porpoises and basking sharks frequently transit through the narrows. On land we have roe deer, red deer, mink, pine martens, weasels, foxes, adders and alpacas. In the air, golden eagles fly the high ridges above while Victor and Orla our resident sea eagles rob fish off the seagulls right outside the patio doors. You can fish, canoe, sail and go walking in some of the wildest country anywhere in Britain. In winter you can sit and look out the window, watch the boats, the wildlife, the weather and the ever changing light. 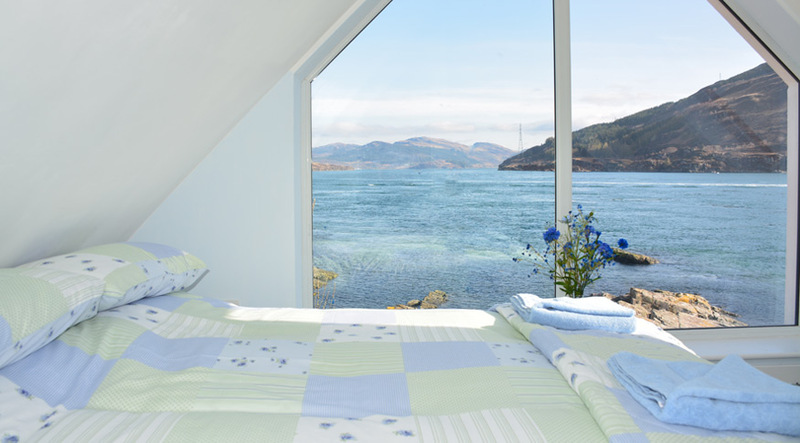 Breathe in and contemplate the best view you will ever see from inside your comfortable holiday cottage. If you ever wanted time to paint or write a book or mend a broken a spirit there could no better therapy than a week at "The House on the Slip". Sitting room: cosy sofas and large flat screen TV. Sun Lounge: cosy sofas with large patio doors to deck. Kitchen/Dining room. 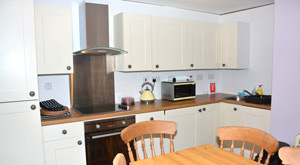 Fully equipped with, electric oven, hob, microwave, fridge, dishwasher, dining table with six chairs. Bedrooms: 1 master double bedroom with en-suite and two twin bedrooms - sleeps 6 people. Facilities: Downstairs bathroom with walk-in shower. Heating and hot water supplied from oil fired combi boiler. Bed linen, towels and electricity supplied.